Have you ever been so desperate you had to resort to begging? Excuse me, sir. I’m sorry to bother you, but I was hoping that you could help me out. My name is Christian, and I was hit by a drunk driver nine years ago and lost my job and for three years I was in a wheelchair and couldn’t work but I’m better now. I still have some issues, you see my bruises [shows legs and arms with serious scars] but I’m working really hard and I run and when I do the dishes at night I do pushups in between each dish to get strong, you see, and it takes me an hour and a half but I’m getting stronger and able to work I even run each night although that can be really difficult I’m getting better. I used to be a glass installer making $60,000 a year before I got hit by the drunk driver and the company said that they would hire me back now if I got strong enough but in the mean time I’m on disability but I’m out of money and just need help for two days, I’ll get my disability check May 1. If you have any paper metro cards with anything on them or just some spare change or anything I could really use your help you know its just a few days but I don’t know what I’m going to eat and anything would help. If you don’t have any money that’s fine but I could really use some prayers so please pray to God that I get this job because it would get my life back together. Thank you so much, God bless you. His story sounded genuine and my heart went out to him. At the same time, the cynical side of me analyzed everything he did, looking for a reason to make me believe that he was just a mooch on society, lying to people to get free money, or would go and immediately spend that money on drugs. And do you know what? Those questions are irrelevant compared to the way people reacted to him. Person after person refused to look at him or even acknowledge his presence. One person didn’t even take his headphones off to see what he wanted. Because they had heard the story just a minute earlier when he had told it to someone else, they knew what he wanted, and completely shut off contact. For all I know, he was a drug addict. For all I know, he was lying directly to my face. For all I know, he had blown his money on useless things like cigarettes or alcohol. I can’t prove that he hadn’t, and I’ll never know. What I do know, however, is that this man was in a really bad place. He was in such a desperate place that he was willing to get on a bus, share his story with complete strangers, and lower himself to begging. How humiliating and dehumanizing! Even after being rejected by the first few people and having others refuse to even acknowledge that he existed, he kept trying, restarting the story in an attempt to get, as he said, “Even if you have a few pennies that will help.” Have you ever been so desperate that you had to ask complete strangers for pennies? What should we as Christians do in situations like these, I wonder? Some will say that you should never, under any circumstances, give money to a person like this for fear that they might use it to hurt themselves with drugs or alcohol. There is a lot of merit to this argument: beyond that fear, money can serve as a way of simply getting rid of the person so that they won’t bother you anymore, making the giver feel good about giving but never actually having to enter into relationship or be challenged. On the other hand, how can we look on someone in time of great desperation, even if it is their own fault, and do nothing? My experience with the poor and homeless is far from thorough and so I in no way claim to be an expert, but there are a number of things that I am trying out myself to see how they work. The first is making sure that I get every person’s name that I speak with, and make it a point to mention mine as well. We can never underestimate the power of humanizing a person that is rarely treated with respect. I let them talk, and I ask them about their life. It’s good to know what they need, and most times I will ask them if they know of a place where they can get food/shelter/clothing. The second this I do is carry extra food or gift cards that I know will go directly to a need. Granola bars are great to keep in my backpack because I know they won’t go bad for a while, and $5 Subway/McDonalds gift cards won’t break the bank for the few I give out but I feel that they are better to give than cash. Lastly, I tell them that I will pray for them, and then I offer a prayer for them right then as I walk away and as well as that evening at communal prayer. For me at this point in my life, I think that I need to err on the side of charity not judgment. Sometimes we are simply called to be a brother or sister to someone in need, not wonder whether or not they’re being genuine or not. I look to Matthew 25:31-46 as a reminder that how I treat the poor is how I treat Jesus. Do I want to be his brother, or his judge? 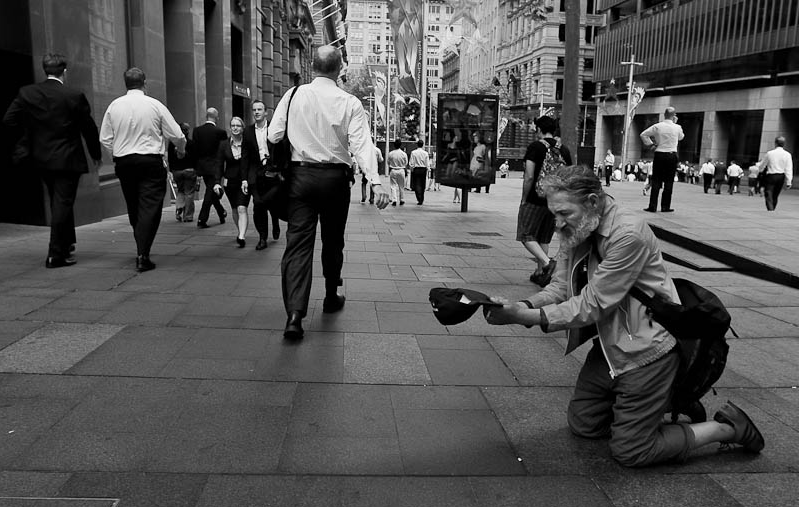 I imagine begging for his forgiveness is much more difficult than begging for a dollar on the street. So true Casey. We all at times look for the bad in people instead of looking for Christ in all people. Let us all think WWJD What would Jesus do? Hope all is well. I really enjoy your posts. Casey, Your reflection reminds me of the times at St. Michael when we would go to serve meals at the homeless shelter in downtown Raleigh. Often, on the way there, the “first-timers” would wonder aloud how many people really needed the shelter and how many were taking advantage of those giving the meals. Once there, they would realize that no one would choose to be in such a place with no privacy and little dignity. On the way home the conversation would change–what we should do differently next time to make the meal better or what other ways we could serve. Entering into a personal relationship with “them” made all the difference. Thanks for sharing your thoughts and hope you are doing well. Hi Casey, I liked your line: “…at this point in my life, I think that I need to err on the side of charity not judgment”. I will too! Wouldn’t it be a wonderful world if we all err on the side of Charity? Charity cultivates caring; Caring builds kindness; kinds to love; love to….. living the will & way of the Lord!